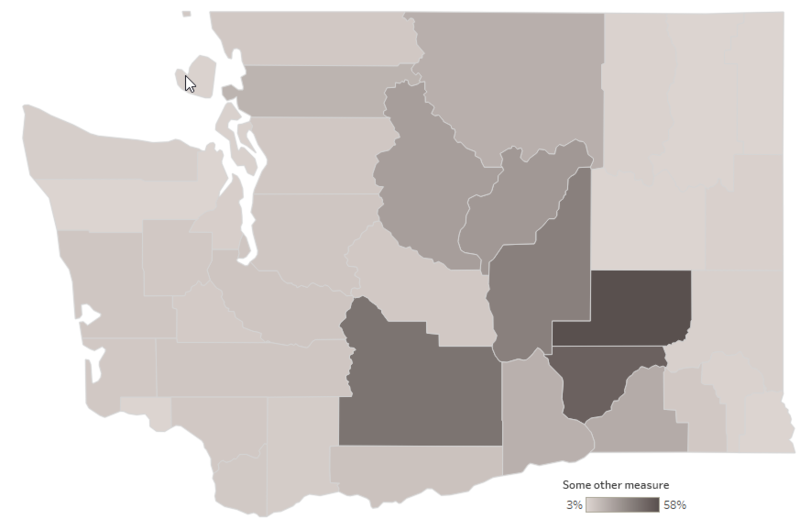 Maps are tricky, especially quantitative choropleth maps. Not because they are hard to make in Tableau. Just the opposite, it takes just a few mouse clicks to make one but is it right? It depends on the data. 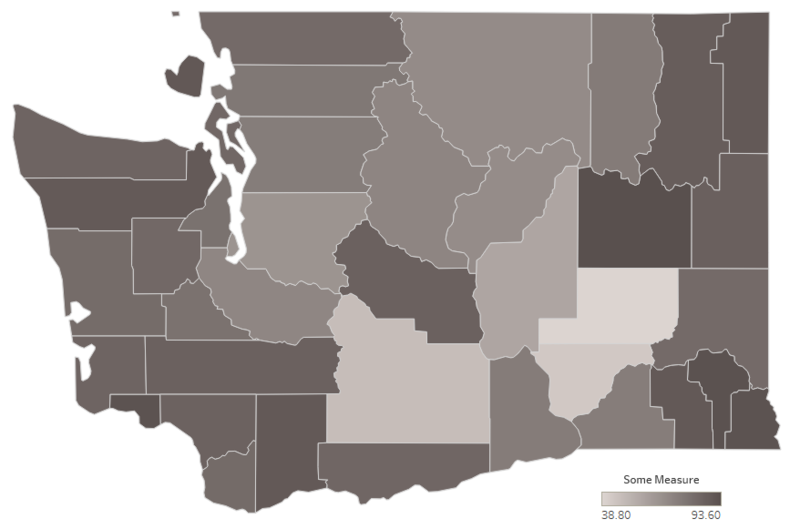 When you drop a continuous measure on the Filled Map, Tableau creates a choropleth map and assigns a unique shade of color to each mark – a sequential color palette. … but it often isn’t and the color assignment requires further exploration. So what are these different classification methods? I’m glad you asked! Below is a list of the most important map classifications. See Tableau workbooks further down in the text for illustration. It divides all values (between min and max) into classes of equal width. For example, percent of Latino population by US County: [5%-10%], [11%-15%], [16%-20%], etc., where the width of the class is 5%. The easiest way to create an equal interval scheme in Tableau is to switch to Stepped Color option in Edit Colors menu. useful as a common classification scheme for comparing multiple maps. not good for skewed data distribution. In a quantile scheme each class contains an equal number of marks. In Tableau, this can be achieved with Percentile Quick Table Calculation. intervals are usually wider at the extremes highlighting changes in the middle values. break points may seem arbitrary and irregular. Natural Breaks classes are based on, yes, you guessed it, natural breaks inherent in the data. This scheme uses an algorithm that creates breaks where there are relatively big jumps in data values. In other words, with this scheme, you should see minimum variation between members of each class and maximum variation in value between classes. Since Jenks Scheme uses algorithm similar to K-means (minimizing distances within groups), a similar result will be achieved with Tableau’s clustering which is based on K-means algorithm. it’s a bit”mathy” and may need some explanation of statistical concepts used. The name says it all, you create your own classes based on the data and what you want to emphasize. 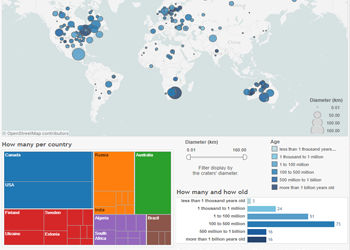 You can create these groups with Tableau calculation. see Pros – mapmakers of questionable integrity can easily manipulate the message. Places breaks at the mean and selected standard deviation intervals above and below the mean. requires map readers to be familiar with basic statisticsl concepts of mean and standard deviation. In this part of the article I will introduce another interesting map classification and show how to make exploring different classifications easy with a couple of parameters. The class interval is calculated as a root of degree N of the range of the data, where N is the number of classes you choose. great for skewed distributions, emphasizes differences in dense parts of the data. 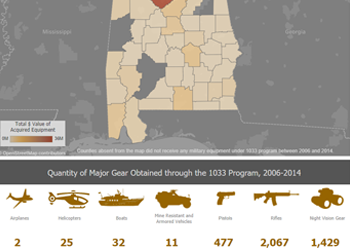 Compare the two maps below, accompanied by histograms of the data distribution. 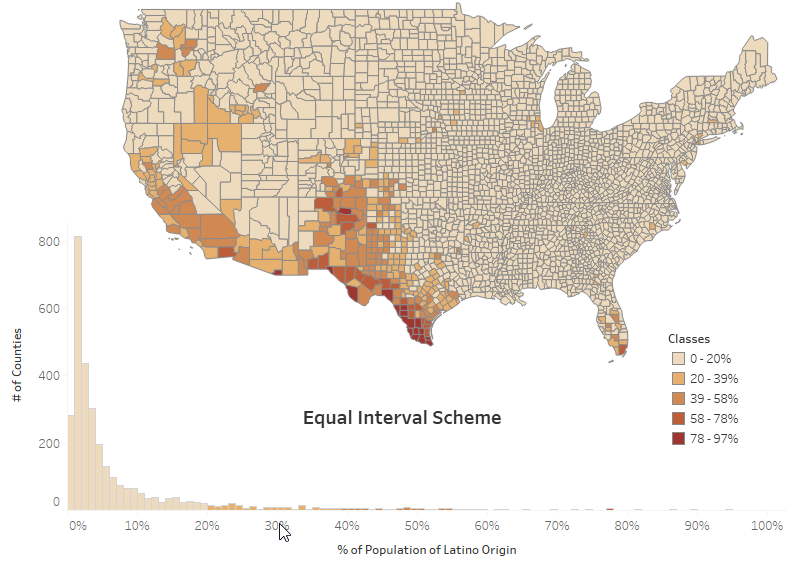 They both show % of Population of Latino Origin by County. The top one uses 5 equal interval classes and the bottom one uses geometric interval classes. For the data like this one, highly skewed, the geometric scheme has a clear advantage of breaking apart values of high frequency. number of decimal places to use in the legend. Note that the equal interval class can be set just by dropping your measure on Color and switching to Stepped Color option in Edit Colors menu. However, this calculated alternative displays the exact class boundaries and allows for highlighting the class by clicking in the legend. Both options are quite useful. 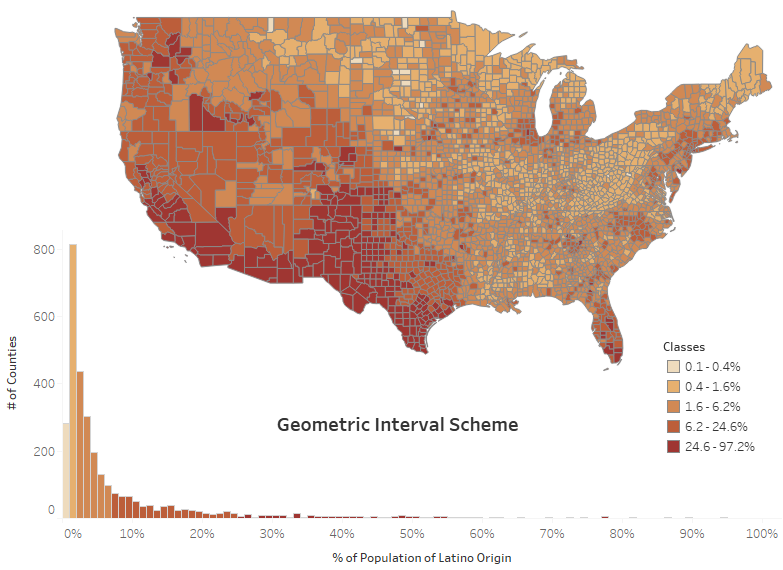 There are plenty of different classification schemes available to color your choropleth map. 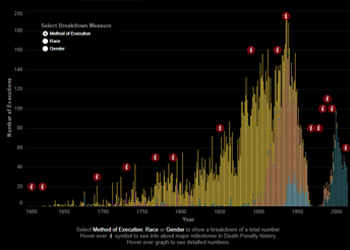 Know your data, check its distribution (view the histogram) and think of the message you want to convey. 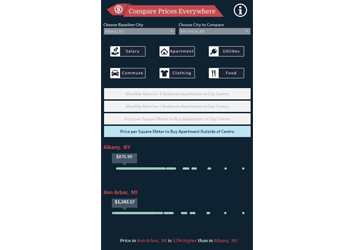 Use calculations and parameters to explore different options and/or give the map viewer options to decide how they want to display it.